The super spice, cloves, comes from a dried bud on the Myrtaceae tree that grows in tropical climates throughout the world, but that originated in Sri Lanka, Indonesia, and Southern India. The health benefits of cloves are so great that the spice is harvested profusely in Zanzibar and is used in folk-remedies around the world – including Chinese medicine. Over 1000 tons of cloves are imported to the US ever year. This incredible spice has an ORAC value Oxygen Radical Absorbance Capacity) that is through the roof – of over 290,000. That’s a lot of antioxidants. This herb is also full of manganese, more than almost any other food. Manganese is an important trace mineral for the body because it activates multiple enzymes, particularly anginas which help in the formation of urea. Manganese also form the enzyme peptides which are responsible for the hydrolosis of proteins in the intestines. This mineral helps with lipid metabolism (getting rid of fat) and keeping the nervous system stable (reducing irritability). Cloves also have anti-viral and anti-bacterial qualities, and can even prevent adult onset diabetes by stabilizing blood sugar levels. Additionally, this amazing spice is able to prevent various allergic conditions and toothaches – just one of many home remedies for toothache. Cloves have been used to treat asthma and as an anesthetic. 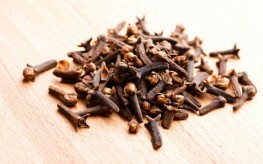 Clove oil can help relieve muscle spasms, as well, so it was used as a natural way to aid in childbirth for centuries. Due to its antimicrobial properties, clove oil can treat skin problems like acne and warts. Clove oil or clove tea can also help treat insomnia. This powerful plant can be used in myriad ways to heal the body. Along with other vitamins and minerals like vitamins C, K, and calcium, cloves can treat multiple diseases which are caused by a deficiency in nutrient dense foods – from cardiovascular problems, depression, and even cancer. Cloves are best when the dried bud is kept in tact and used fresh; however, there are tinctures, dried powders, and even clove teas that can be used on a daily basis. If you can obtain clove whole and grind them yourself, you will be consuming more of the antioxidants and healthful constituents. A hot tea prepared with cloves, cinnamon and bay leaves is incredibly tasty and full of health-restoring properties. Experience the health benefits of cloves today! so which food is the highest in manganese if cloves are ALMOST the highest? Difficult to say because it depends on where it’s grown. I believe pineapple is often very high because of the soil in Hawaii. But whole grains and legumes come top because you can eat large amounts of them. How should whole grains and legumes be prepared? How do you personally prepare them? The question is reasonable. We can’t just assume anything. However, things grown closer to mountains and especially to streams flowing from uplifted areas may be more mineralized. In aromatic spices, it may be possible that differences of intensity may be discernible. A cinnamon that has more scent “kick” to it may be better. Plants can absorb minerals, if minerals are present, but no they can’t make minerals. About this time the Mental Health Association is contacting the FDA to have herbs by prescription only. Beware all mental “health” cultists—the “he is insane whom we so deem” type of Inquisitor lobbying against all cheap natural remedies. clove is available in any Indian grocery store in north America almost every cities. When you are making tea specially black tea put 1 or two clove then you can get the smell of tea. adjust the number of clove as per your test and quantity of cups. Where can I get clove tea ? You’re so cool! I don’t believe I’ve read through anything like this before. So great to discover another person with some unique thoughts on this subject matter. Seriously.. many thanks for starting this up. This web site is something that is required on the internet, someone with a bit of originality! I keep reading that the soil is depleted of minerals because of farming methods over the last 50+ years. I also keep reading that certain plants are a rich source of a particular mineral. How? They cannot manufacture minerals surely?